Some brides will pay for your gown however most of the time and as etiquette says this is at the bridesmaids cost. Within reason of course, your'd hope no bride would ask you to fork out an excessive amount on a dress. The bride will also want your input on the dress and you be supportive and not whinge because it's not exactly what you want. It's the maid of honors duty to plan the bachelorette party but the bridesmaids are expected to put forward ideas and suggestions and of course a little cash. Unless your significantly out of town or overseas you should really attend any wedding-related event. At the very least the rehearsal which will be within a few days of the wedding so make sure you are in town a few days early. 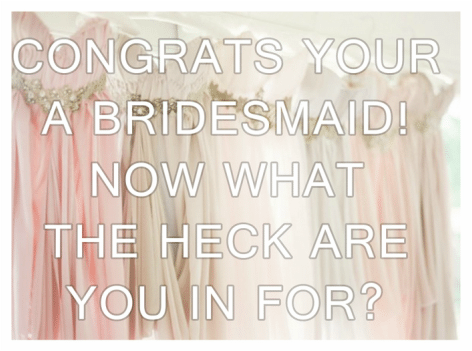 You need to be there to help with decisions, listen to bitching and put up with bridezilla moments. If you can, help out with small duties and errands and basically make sure the bride is having a good time planning her big day. You will be the glue that holds the dance floor together on the night, set a good example by getting out there and dancing up a storm.